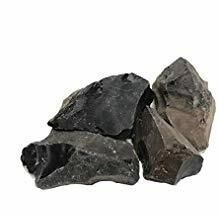 Flint Knapping- stone tools from flint, chert, or obsidian by the process of lithic reduction. Sounds annoying, but what is flint knapping really? Flint knapping is an addiction one acquires attempting to create to a tool by smacking one stone with another. 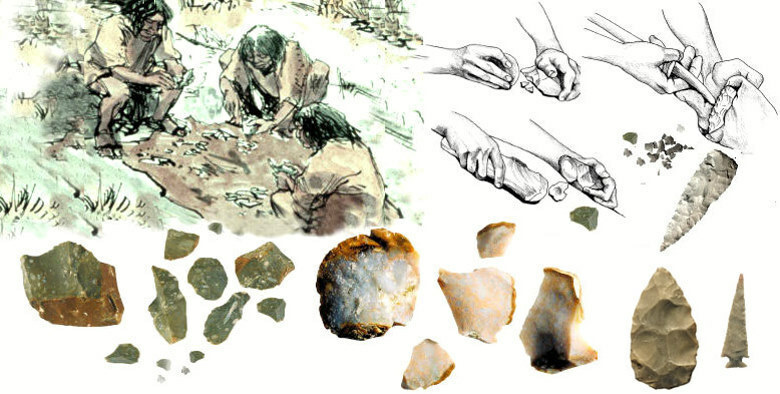 Ancient people knapped flint to create all sorts of tools for cutting, scraping, or for use as projectile points. Later knappers made flints for flintlock firearms. 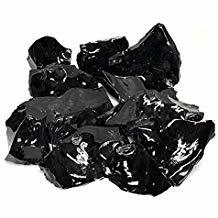 Today surgeons are experimenting with obsidian scalpels which are many time sharper than those made of steel. Early results from these tests are quite positive, with wounds healing more quickly due to finer incisions. If you are interested in trying your hand at flint knapping stock up on Band Aids. The Hammerstone is the most basic tool in the flint knappers toolkit. Often made of limestone or quartzite, a suitable hammerstone is oval in shape and fits comfortably in your hand. 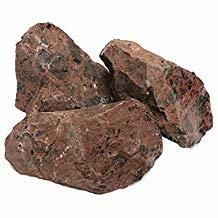 Excellent hammerstones can easily be found in your local river or stream. 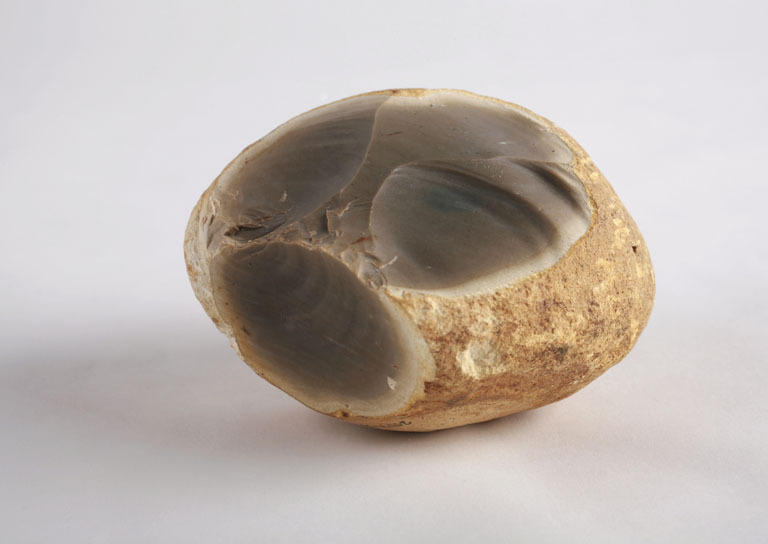 Hammerstones are used in the initial process of lithic reduction, removing useable pieces from the larger core. The Antler Billet was an integral piece of the ancient flint knappers tool kit and is still commonly used by modern knappers. 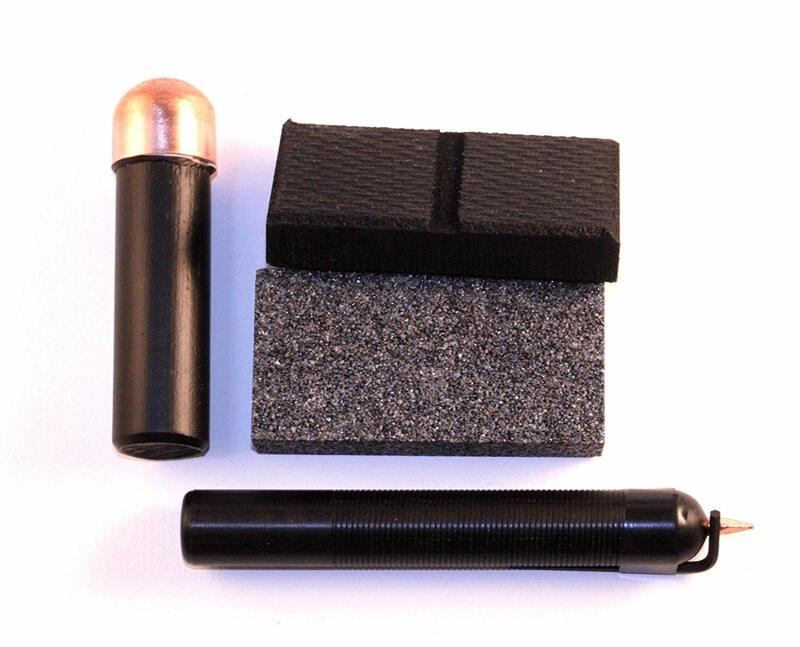 The tough yet elastic properties of the antler billet allow for more controlled percussion flaking. The pedicle end of moose and elk antlers are most commonly used for billets. Early knappers used pressure Flakers made of antler tines. Modern flint knappers use antler flankers or flakes made of copper nails mounted in wooden handles. Pressure flaking was used to remove tiny flakes while finishing blade edges and for making notches in blades and projectile points for hafting. Pressure flaking was also used to resharpen blades throughout the course of their lifetime. 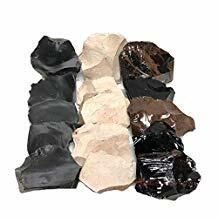 These low-cost flint knapping supplies on Amazon offer excellent value for the beginning knapper. All of the supplies list here are Buy It Now auctions. 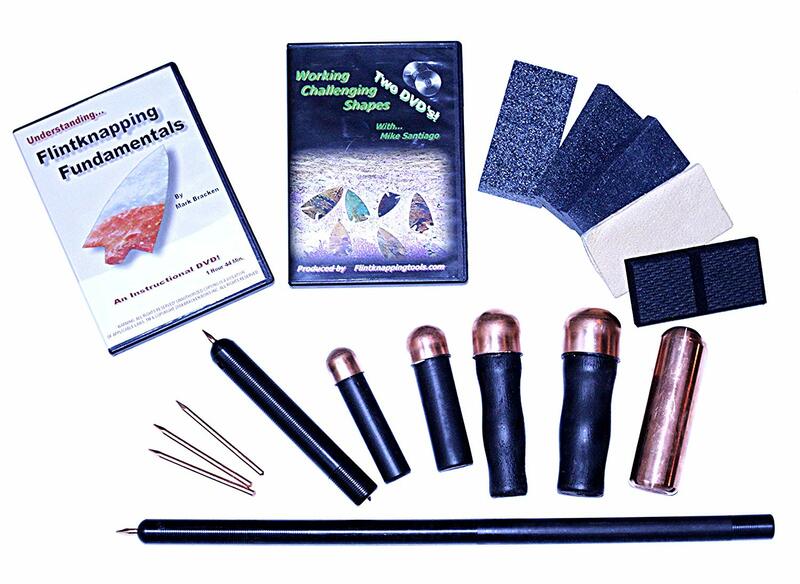 Flintknapping Kit with Copper Bopper Billet, Upgraded Kit, Learn to Knap! What kind of stone is suitable for knapping? Any conchoidal fracturing stone may be used by knappers to create tools. 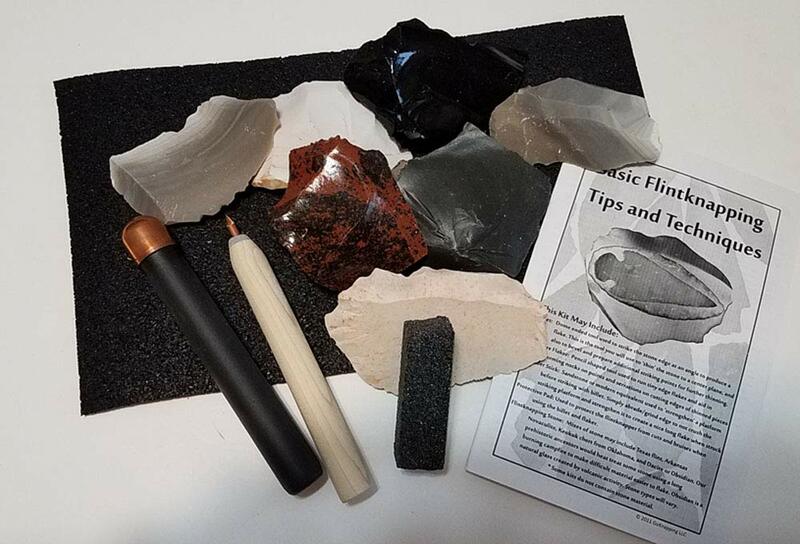 Flint, chert, obsidian, chalcedony, and novaculite are all commonly used by flintknappers. Modern knappers are taking advantage of many rare and exotic materials available today to craft beautiful colorful points. Some of these exotic materials include agatized coral, dinosaur coprolites (poo), and fossilized dinosaur bone. Two more inexpensive, readily available, and easily knapped materials are John stone and bottle glass. John Stone is porcelain from an old toilet tank. Although the result of knapping porcelain will not be beautiful the soft but brittle properties of porcelain make it very easy to knap. Porcelain is excellent material for beginning knappers who want to practice their technique. Bottle Glass or more specifically the bottom of a glass bottle is another excellent inexpensive source of Knapp able material. The results of knapping bottle glass can be quite stunning (see photo below) and useful as a tool. Keep in mind however if you are emptying the bottles as you go the dangers of knapping grow exponentially. I do not recommend sitting down and trying to knap 24 arrowheads out of bottle glass on one Saturday afternoon. The lithic reduction is the process flintknappers use to create stone tools such as knives, spear points, arrowheads, or scrapers. 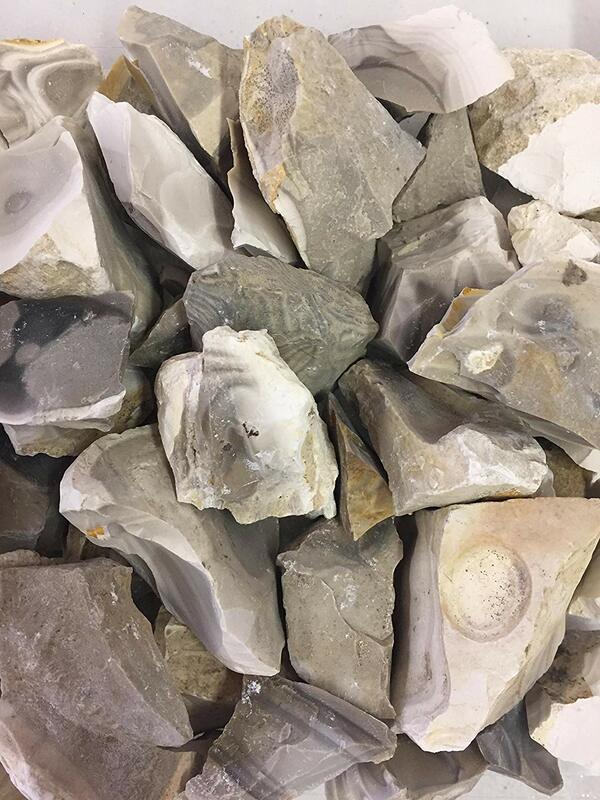 Ancient flintknappers began this process by using a hard hammerstone to drive large flakes or spalls off a core (a large lump of flint, or other stone suitable for knapping). These large flakes or spalls could be used as tools in their own right or worked into blanks for easy transport and refinement into tools at a later date. Percussion Flaking is the process of removing small thin flakes from a blank or a preform by striking with a hammer stone or antler billet. The removal of these thin flakes allows the knapper to thin and refine the shape of a preform or blank to the desired shape. 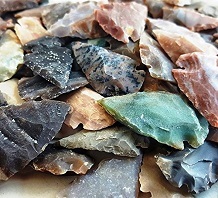 A skilled flintknapper can produce a fine quality arrowhead or spear point simply through the use of percussion flaking techniques. 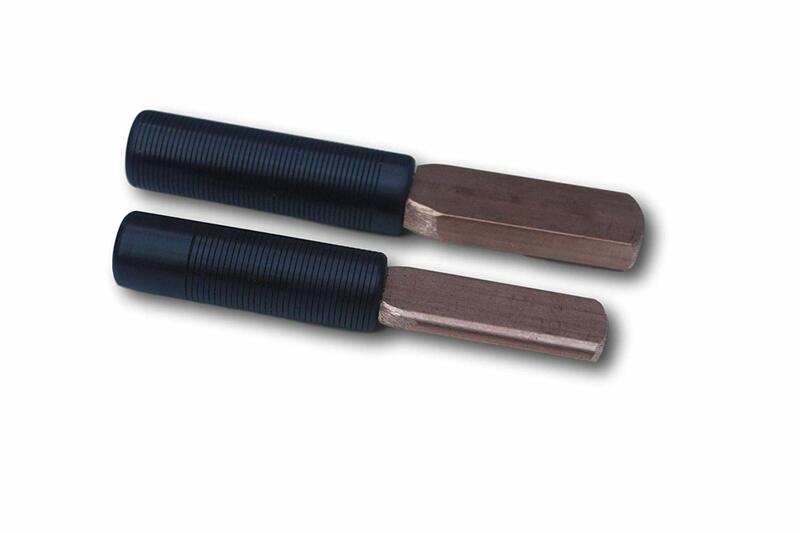 Pressure Flaking is the technique of pushing very small flakes off a preform using an antler tine or other pressure flaking tool. Pressure flaking is used to make the final refinements to a stone tools shape, adding notches, or sharpening a blade dulled by use. Did I miss something? Is there something you would like to see added? Did I hit the nail on the head? Have you tried knapping? Are You planning to try flintknapping? Let me know.